The Alberta Construction Association is looking for assistance with developing and updating trade definitions, and aligning them with resources like MasterFormat and UniFormat. CSC past-president Keith Robinson, FCSC, FCSI, RSW, LEED AP, is the CSC Edmonton Chapter representative providing support for the initiative. The Gold prize went to Amy Mielke and Caitlin Taylor (Water Pore Partnership) for their idea of a water-absorptive ‘urban skin’ surface and subterranean basin that would capture Las Vegas’ rain runoff, and add more than 75,000 ML (20 billion gal) to the city’s water supply capacity. Danish architect Bjarke Ingels’ firm, BIG, took the Silver prize thanks to its urban flood-protection concept for Lower Manhattan. The 13-km (8-mi) long infrastructural barrier includes various raised berms and other public-space infrastructure to mitigate damage caused by hurricanes. A zero-carbon compostable structure, recently on display at MoMA New York, claimed Bronze for designer David Benjamin (the Living architecture lab). It uses advances in biotechnology, computation, and engineering to create a new building material—bricks comprising corn stalks and fungal organisms—that is almost fully organically grown and compostable. 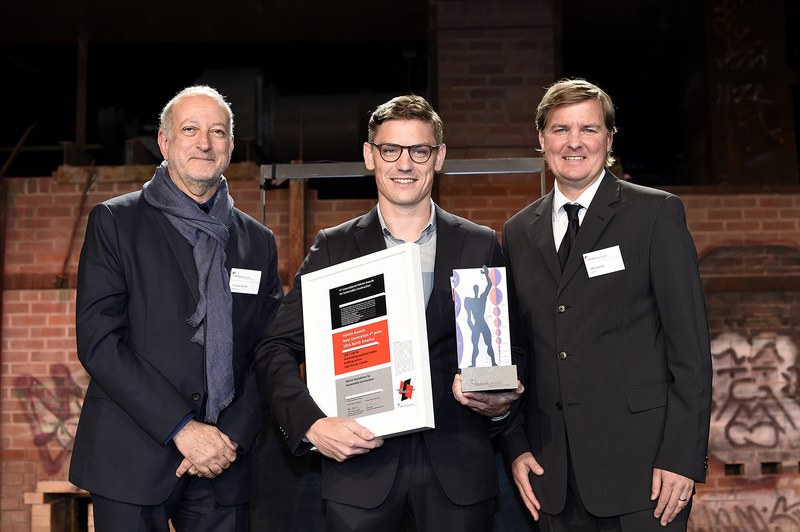 Canadian projects were also among those recognized at the ceremony, held at Evergreen Brick Works in Toronto—itself a 2008 Holcim Awards prize-winning project—and featuring a keynote speech by the city’s former mayor, David Miller. 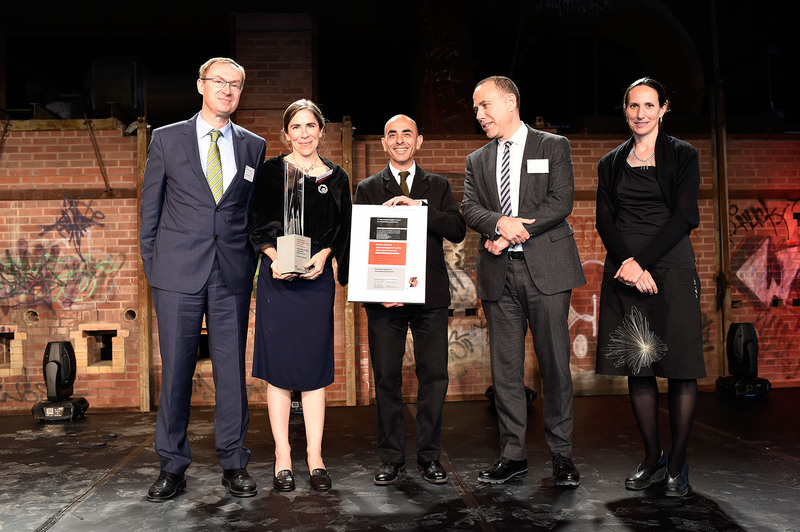 Katherine Faulkner and Nader Tehrani, of Boston’s NADAAA Architects, stand with Holcim Canada CEO Baudoin Nizet, Dean Richard Sommer of the University of Toronto’s John H. Daniels Faculty of Architecture, Landscape, and Design, and Canadian jury member Lola Sheppard (Lateral Office). 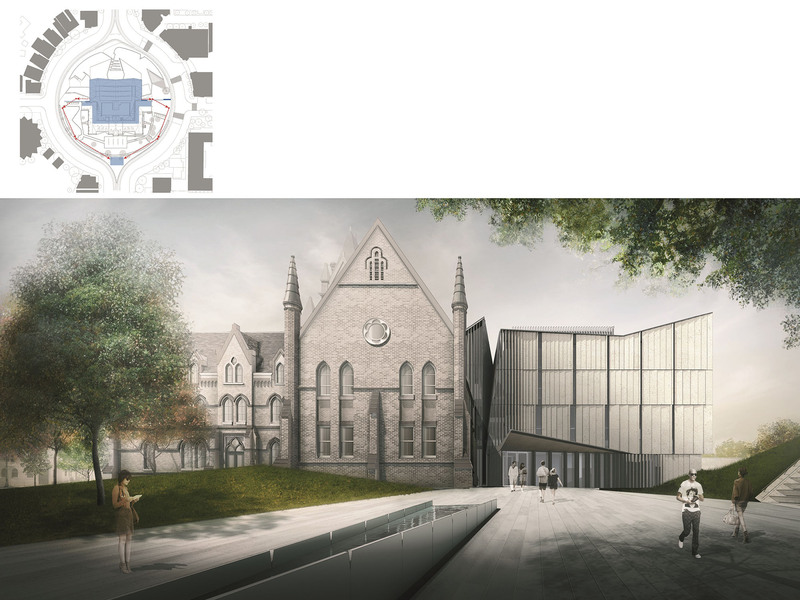 Boston architects Nader Tehrani and Katherine Faulkner (NADAAA) received an Acknowledgement prize for their renovation and extension of the University of Toronto’s 19th century John H. Daniels building, located downtown. Additionally, in the Next Generation category for young design professionals, Toronto’s Jonathan Enns (solidoperations) was awarded for his concept of an interlocking panelized timber building system—suitable for multi-family construction in remote areas. Both projects will be the focus of future web articles on Construction Canada Online. ● Peter and Hadley Arnold (Woodbury University’s Arid Lands Institute) for a digital tool for urban design and water-use planning in Los Angeles. Timber-Link is an interlocking panelized timber building system concept from Jonathan Enns, solidoperations. He is flanked by Holcim Award jury members, Mexican architect Enrique Norten (TEN Arquitectos) and Canadian architect, Jeffrey Laberge (J L Richards & Associates). Namjoo Kim (MIT) for a new method for creating thin concrete panels. A jury of international experts, led by U.S. architect Toshiko Mori, selected the winners using criteria for sustainable construction referred to as the five Ps: progress, people, planet, prosperity, and place. The intent is to consider environmental, social, and economic performance, while also highlighting the need for architectural excellence and a high degree of transferability. The top three regional North American winners will now go on to next year’s global competition, measured against other projects from Europe, Latin America, Africa/Middle East, and Asia Pacific. More information on all the projects can be found at www.holcimawards.org/nam.